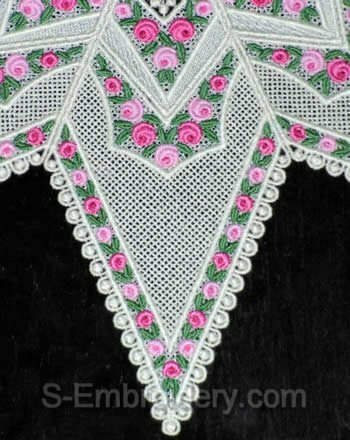 A set of 2 delicate freestanding lace mini rose decorated embroidery designs. 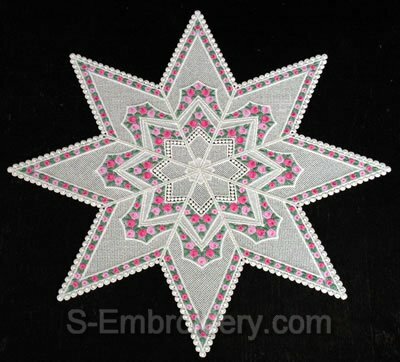 The designs are combined to produce a fine freestanding lace star-shaped doily. Further down this page you will find images of the doily we have prepared using this set. Each of the 2 designs was stitched out 8 times. The diameter of the doily is 18 inches (47 cm). The star doily isjust beautiful.